Published October 24, 2015 By Leisa Good This post may contain affiliate links. Regardless, I only recommend sites I've researched and/or used and trust. Are you looking for ways to sell your crafts handmade wares online? Do you want to add another site like Etsy to your work-at-home (WAH) list? Would you like being part of a trusted company? Well, now Handmade at Amazon might be your solution. What Exactly is Handmade at Amazon? Well, everyone knows what Amazon is—a great place to buy or sell books, CDs, DVDs, and many other things. It's a great place to sell your used goods, too. Now, it is on the verge of becoming a great place to sell your handmade wares directly on Amazon, similar to Etsy. Is It Free to Join Handmade at Amazon? It is free to sell on Handmade at Amazon as long as you meet the invitation requirements. You will do that after clicking the “request an invitation” button on the home page. Upon review of your application and the pictures of your products indicating that they really are handmade by you, you should receive an invitation to join. Once you receive that invitation, you will be able to set up an account and set up your profile, list your products, and begin earning a profit on them by making them available to buyers all over the world. How Much Money Can You Earn With Homemade at Amazon? The money will vary based on what you are selling and the price and category. Categories include home décor, jewelry, patio, furniture, baby, bath, and bedding. These are the most popular categories, but there are several others. Handmade at Amazon will be a separate category on Amazon so your products will appear alongside other handmade items for customers to browse, discover, and shop. All products that you list in your Handmade at Amazon store must be either made entirely by hand, hand-altered or hand assembled. Nothing can be from a kit. How Does Handmade at Amazon Work? 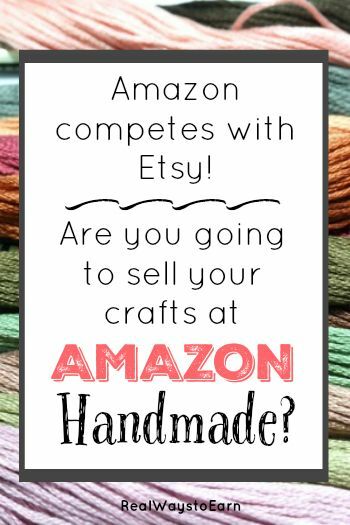 After you register with Handmade at Amazon, you will create an artisan profile. This is where you tell customers what inspires you and how you go about making your crafts. You can even use your own product pictures to tell the story. When you are registered at Handmade at Amazon, you’ll become a part of the Sponsored Products advertising program and will be able to promote your products. You can even add your own bar code to each product. You can choose to include your products in the Fulfillment by Amazon program if you'd like for Amazon to ship them for you. What About the Amazon Associates Program? Do you have a website or blog? You can earn back 10% of Amazon sales from other related products on your own website. They will give you the links and a code to put into the products. You can go here to learn more about how Amazon Associates works. How Do Interested Individuals Sign Up at Handmade at Amazon? Just go to their their website and fill out the application to see if you will receive an invitation. Good luck to all who take on this new venture and with this new launch from Amazon! If you're looking for some more options, be sure to check out this previous post with a list of 6 popular places to sell your crafts. I found this article most helpful. While I continue to sell my books through Amazon (mostly because there isn’t a better choice), I will never sell my jewelry there. I’ll stick to Etsy. @Krista Cagg – very good to know! Glad that you liked the article.